Now that we’ve reached the midpoint of summer, many farm crops are ready to be served at our tables. 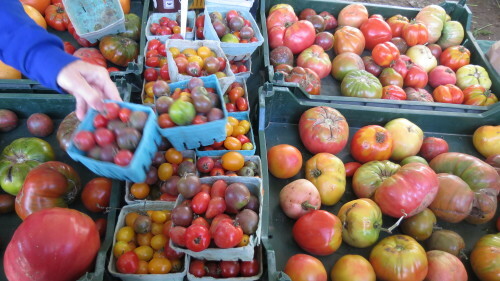 We visited the Withrow Farmers’ Market for the first time today to check out the vendors and see what was in season. 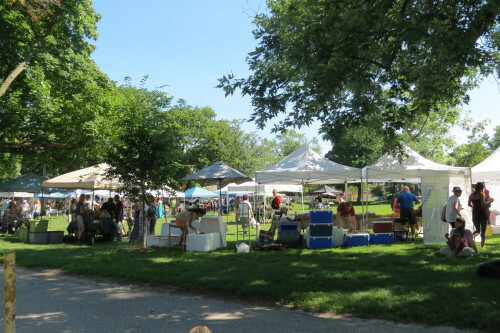 Withrow Farmers’ Market is located in Withrow Park at 725 Logan Avenue and is open Saturdays from 9 a.m. to 1 p.m. You shouldn’t have any trouble finding street parking near the farmers’ market. Our first stop was Fiddlehead Farm from Prince Edward County. 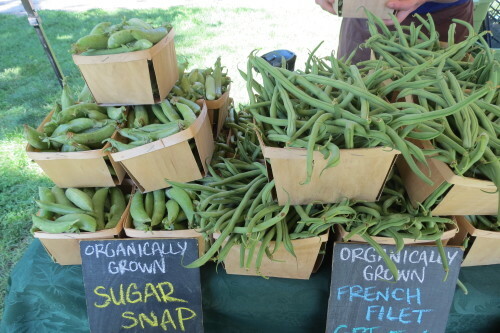 The sugar snap peas looked wonderful, as did the French green beans. There may be only one week left for the sugar snap variety. Fiddlehead Farm also had several varieties of kale for sale. Being a fan of kale, I couldn’t resist purchasing a bunch of organic Dinosaur (Black) kale for $3. 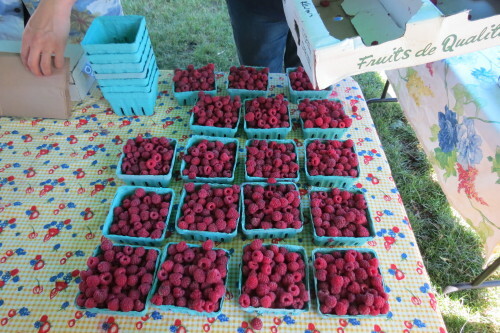 Next stop was Feast of Fields, a Lincoln farm in Niagara Region, who had fresh organic raspberries, cherries and blueberries for sale. I decided to purchase a pint of organic raspberries for $5 considering that this may be one of the last weeks for raspberries. The vendor informed me that all of the berries were super sweet this week. 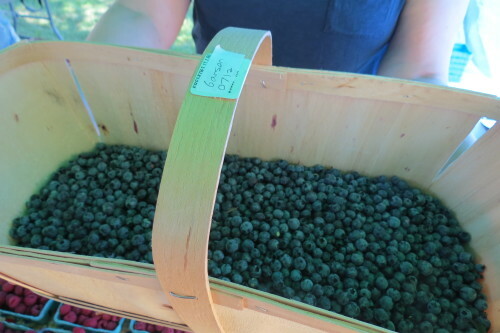 Blueberry season in Ontario has just started so you’ll be able to buy organic blueberries from Feast of Fields for the next couple of weeks. 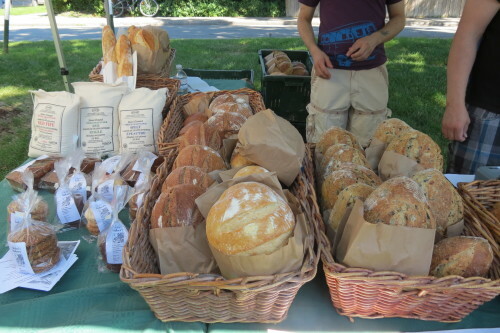 I love the story behind St. John’s Bakery on Broadview Avenue [the artisan bakery began as a non profit organization to provide skills and jobs to the unemployed; bakery workers have included people dealing with addictions, single parents and refugees] and was delighted to see them selling their organic bread at Withrow Park Farmers’ Market. Organic breads include country (rye) sourdough, Celtic, olive cilantro, Cassoni, baguette and walnut raisin and range from $5 to $6.50 a loaf. We were out of soap so when I saw the Soap du Jour booth, I was pleased. Soap du Jour’s soaps are 98% natural with the only man-made ingredient being fragrance oil. The soaps are olive oil based and contain shea butter and cocoa butter and produce quite a lather. I chose the Mango Tangerine scented soap. All soaps are $4 and there were misshapen soaps for sale for half price. 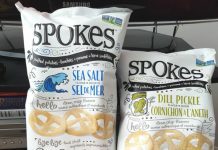 Need to put together dinner in a hurry? Then pick up one of Eudora’s instant curry sauces. All you have to do is cook your main meal e.g. chicken, beef, shrimps, then add one of Eudora’s curry sauces to the pan and heat thoroughly. I sampled the coconut curry, which is quite mild and would taste great with shrimps. 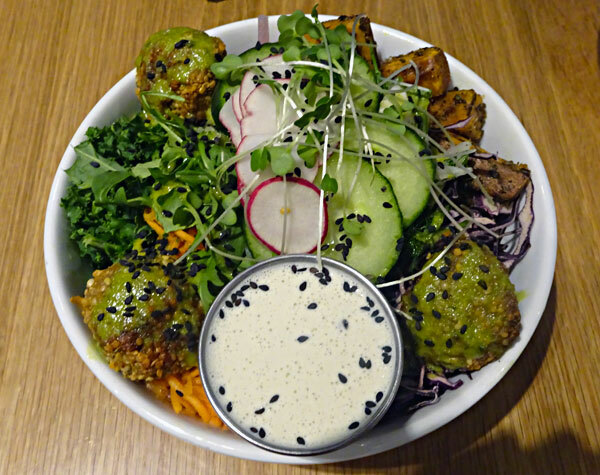 Other curries include Vindaloo, Khaldin, Green Curry, Butter Chicken and Kofta Curry. Curries at $6 a jar. I stopped by Organic Greens due to the wide selection of greens available. The owner let me sample French Sorrel greens, which have a tangy citrusy-raspberry flavour. You can add French Sorrel regular greens to spice up your salad. If you enjoy making fresh juice, you’ll love the look of the beets at Cookstown Greens. 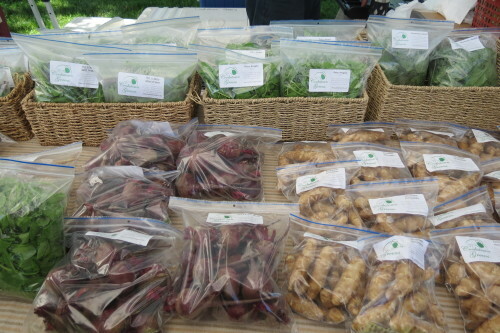 Red or white beets are $5 a package. There are several other vendors at Withrow Farmers’ Market selling fresh pickerel and perch, honey, chocolate, maple syrup, fresh chicken and turkey eggs and pasture-raised chicken, beef, lamb, veal, poultry and pork.